The Cosmetic Extraocular Implant (JewelEyeTM) was developed by the Netherlands Institute for Innovative Ocular Surgery. The device can be implanted within the superficial, interpalpebral conjunctiva. The implant does not interfere with the ocular functions, ie the visual performance and ocular motility. The implant is made of a specially designed material that can be molded in all kinds of desired shapes and sizes. 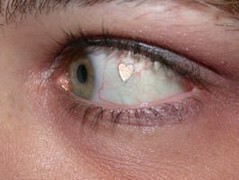 The JewelEyeTM device is 3.5 mm in diameter and available in the following shapes: ring, heart, star. ring. The devices are packaged in a box with 10 sterile devices and the guidelines for use. In the Netherlands, a Cosmetic Extraocular Implant is not considered a medical device. Patent applications for the Cosmetic Extraocular Implant are pending.